(Vimeo via Barstool Sports) I think you guys know me well enough by now to know that I don’t like to make fun of bicyclists getting seriously hurt. It’s just in poor taste. I mean, I think they’re assholes, but I’m not out here to advocate them being maimed or killed. I try to stay away from stories where a bicyclists gets hit by a car or thrown into a sinkhole or eaten by a bear or whatever. I’m just not that kind of blogger. So when I saw this video, my first instinct was to feel bad for the bicyclist who gets hit by the car. I mean, it’s not HER fault that whoever organized this race completely forgot to make sure speeding cars couldn’t just plow right on through a crowd of bicyclists (NOTE: upon further review, the car seems to be a hybrid, so maybe “speeding” isn’t the right word). Regardless, whoever organized the race is probably deserving of more than a little scorn. THEN I watched the rest of the video, and oh man, you guys. Oh man. It is just absolute vintage bicyclist. I still feel bad for the woman. I just want to be clear about that. But just look at that picture at the top here. If you see what appears to be a bicyclist RUNNING OVER the woman who just got hit a car, that’s because it is, in fact, a bicyclist running over the woman who just got hit by a car. Yup, despite the fact that TWO POLICE OFFICERS AND A RACE OFFICIAL are standing there directing bicyclists around the injured woman on the ground (who is also clearly visible, by the way), a whole host of racers remained stalwart in their “RULES AND LAWS DON’T APPLY TO ME!” philosophy and bravely plowed through the makeshift barricade to defend their GOD-GIVEN RIGHT to go wherever they want. Do I think the guy hit that poor woman on purpose? Nah. But this is just the logical extension of the bicyclist lifestyle. This is what happens when your whole philosophy is centered around not obeying rules. Oh well. Can’t be a bicyclist without breaking a few eggs or something like that. 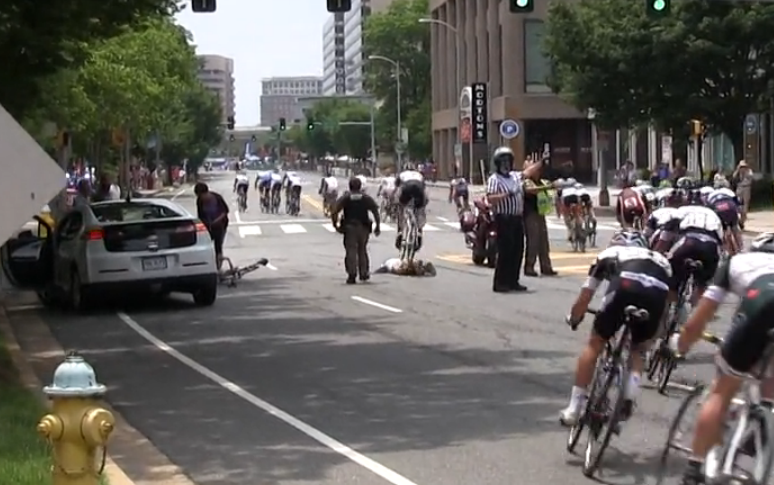 UPDATE: Apparently the first lady wasn’t run over by a car, she was a race official who was run over the bicyclist you can see on the ground next to the car. Frankly, this just makes the whole thing 1000x better. This entry was posted in Stupidity and tagged bicycle, bicyclist, biker, biking, cycling, cyclist, idiots, road warrior. Bookmark the permalink.